Luanda is a bodywork practitioner and co-founder of Luna Nueva Wellness Collective. Descended from a lineage of healers, she inherited ‘healing hands’ from her parents. Despite this, her academic pursuit of the healing arts began at the San Francisco School of Massage. After becoming a certified bodyworker versed in the western modalities of massage, she sought out more traditional forms of healing bodywork. This interest brought her to Bangkok, Thailand where she studied Thai Massage at Wat Pho Traditional Massage School and Aotearoa (New Zealand) where she attended the 2017 ‘Te Rongopae- Clear Bright Horizon’ workshop. In the workshop, she learned traditional Maori bodywork, mirimiri and romiromi, with Atarangi Muru and Charlotte Milton. However, her certification in tui-na massage at the Academy of Chinese Culture and Health Sciences in Oakland, CA redirected her interests back to her Chinese roots. 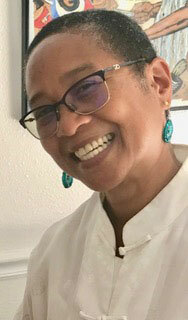 Sharing medicine (bodywork, herbal medicine or self-care techniques) are the primary pillars of her practice.